Behind the wheel of Ford’s EcoSport crossover. Ford’s newest model is this 2018 EcoSport. The 2018 EcoSport gives Ford a critically needed crossover, a new model that fills a hole in the brand’s product lineup. The new-to-North-America vehicle is Ford’s smallest SUV yet, a product it has offered for years in countries such as Brazil and India, with the latter supplying the vehicle to the American and Canadian markets. Ford offers the 2018 EcoSport in four trims: S ($19,995), SE ($23,000), Titanium ($25,880) and SES ($26,880). Add $995 for the destination charge. Front-wheel drive is standard; all-wheel drive is available. You’ll find two engine choices and an automatic transmission. With the EcoSport kicking off the utility vehicle range, Ford now offers seven SUVs and crossovers. The EcoSport slots beneath the Escape, followed by the Transit Connect, Edge, Flex, Explorer and Expedition. Ford says it will soon have 10 utility vehicles in its portfolio. One is already known: the 2020 Bronco. There is a lot to consider when looking at one of Ford’s smallest vehicles. We will approach this by dissecting five key elements of the vehicle. We will also examine each of its strengths and weaknesses. 1. Truly a subcompact SUV. 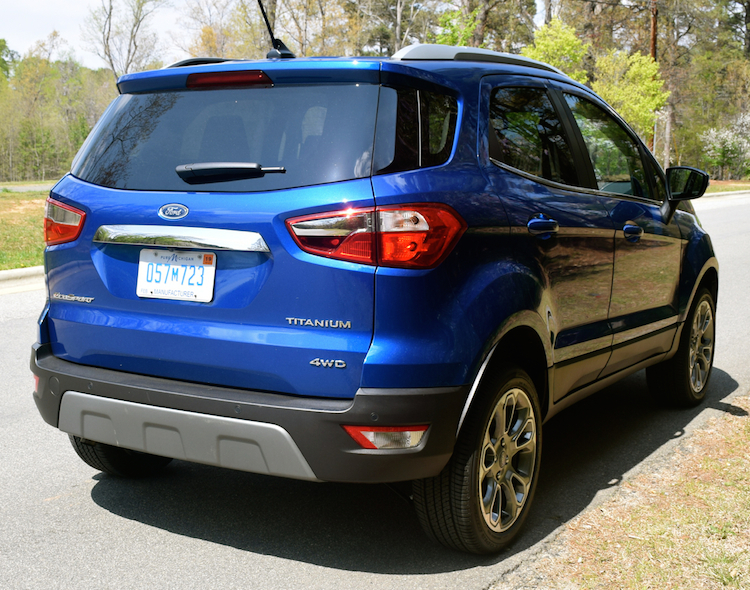 The EcoSport enables Ford to fill a glaring hole in its product lineup. For years, the Escape served as its entry-level model, but as manufacturers considered and followed through on building smaller models, Ford seemed to fall behind. Now the automaker can claim a legitimate competitor in the segment, taking on such rivals as the Honda HR-V, Chevrolet Trax, Mazda CX-3, Kia Soul, Toyota C-HR, Hyundai Kona and the Nissan Juke (the replacement Kicks arrives this year). Most of these models offer standard front-wheel drive. Only the Toyota and the new Nissan don’t offer all-wheel drive. 2. It has its own design. You have to give Ford credit for developing utility vehicles that share few design elements. Each one offers a distinctive look, although most deliver some variation on Ford’s horizontal grille theme. As for the EcoSport, its small proportions are evident with just one scan of the body. Ford wasted no sheet metal, as the shortest of overhangs mark its tiny frame. The most interesting feature of this model? That would be its hinged rear door, an uncommon design popularized by the first-generation Toyota RAV4 and the Suzuki Samurai. Unlike the other two, Ford doesn’t hang the spare tire on the outside of the door. In fact, you won’t find a spare at all — a tire inflation kit sits underneath the storage compartment floor. Take my advice: invest in a spare tire, a jack and a lug wrench. Only a spare will protect you in the event of a blowout. 3. You’ll find room for five, but not really. There is a trend with manufacturers to offer as many seat belts as possible in their vehicles, especially the small ones. Where it is obvious that five couldn’t possibly fit comfortably, the 2018 EcoSport is best for four. 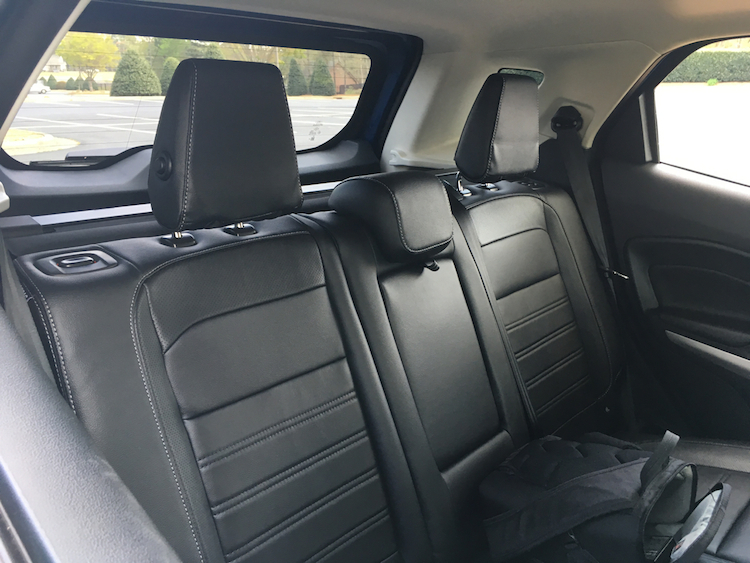 Even with one less person sitting in the rear, you would be hard-pressed to supply any legroom back there if you are a tall driver with an equally tall passenger sitting up front. I am about six-feet tall and routinely push my seat back. In the EcoSport, doing so cuts out the rear seat legroom completely. If you don’t push the driver seat back much, the rear seat does offer an interesting feature. Namely, raised or stadium seating for better outward visibility. 4. Tech features that are (mostly) pleasing. 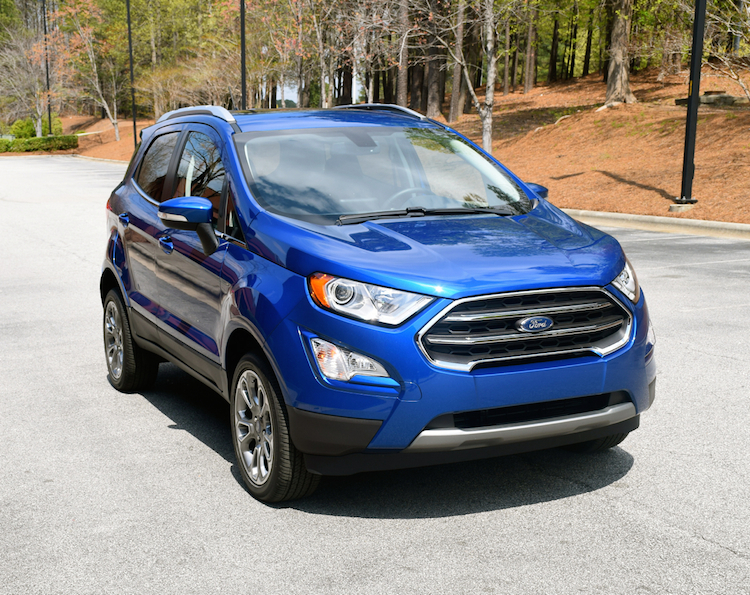 The 2018 EcoSport offers many of the technologies customers want. Particularly if you move beyond the base model. But at least the S edition does have a six-speaker audio system with a 4.2-inch color display and two USB ports that are also illuminated — this feature is especially helpful when connecting at night. Move your way up through the trim levels and you’ll find Ford’s SYNC infotainment system with either a 6.5-inch or an 8-inch color display. 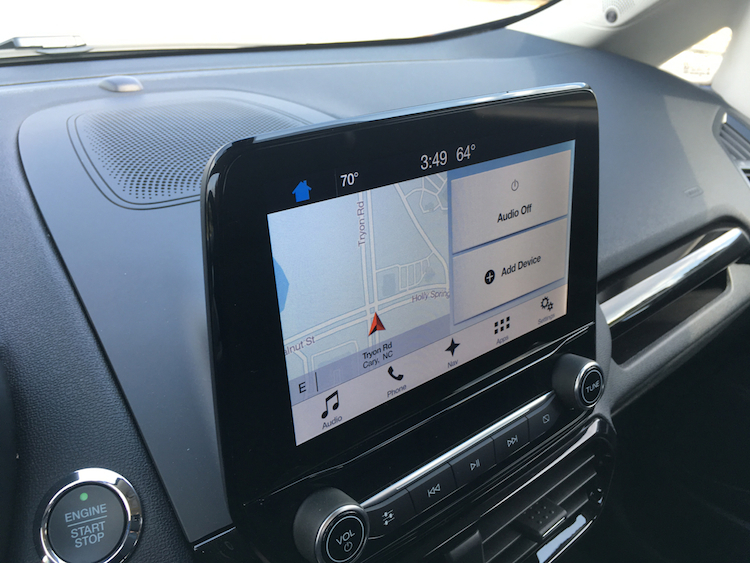 Apple CarPlay and Android Auto compatibility are smartphone features customers demand and Ford supplies. You will even find an available WiFi hotspot. As for safety technologies, the list is very thin: you get a rearview camera and rear parking sonars. Lane keeping assist and rear cross-traffic alert come with the SES trim only. 5. Two engine choices and an automatic transmission. Most tiny SUVs offer one engine and transmission combination. With the 2018 EcoSport, you will find two. But only the larger of the two engines come paired with the available all-wheel drive. The base power-plant is a turbocharged 1.0-liter three-cylinder engine making 123 horsepower and 125 pound-feet of torque. The optional engine and the one found in our test vehicle was a 2.0-liter four-cylinder power-plant with an output of 166 horsepower and 149 pound-feet of torque. That is quite a spread in performance. Both engines work in tandem with a six-speed automatic transmission. We cannot comment on the base engine other than to say it is still offered in the Ford Focus, which also has the same four-cylinder engine. What we can say is that it is hard to imagine driving this utility vehicle with a less powerful engine, especially when carrying two or more people or at least two individuals and their extra gear. This model is rated to tow up to 2,000 pounds when properly equipped (1,400 pounds with front-wheel drive). 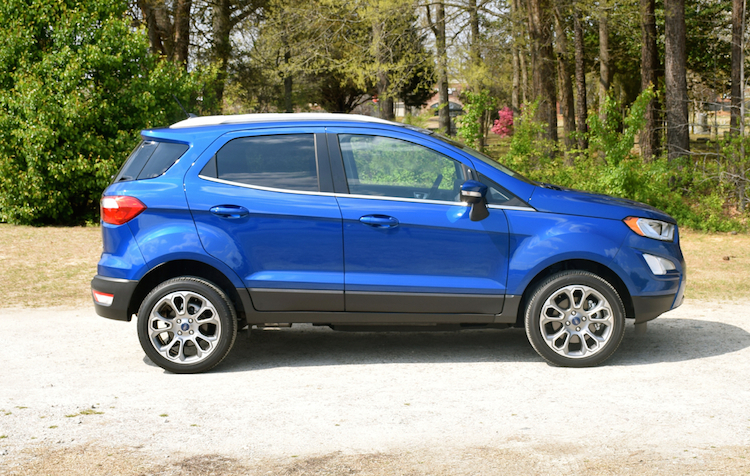 The EcoSport delivers a cushioned ride and that is a notable trait for a small vehicle. Its steering seemed disengaged at times, even prone to some wandering, but we found the EcoSport handles curves with only minimal body roll. Firm brakes bring this SUV to a confident stop. The most disappointing aspect of the EcoSport from a performance perspective was its relatively poor fuel economy. As in an average 22 mpg. That may not too far below the 25 mpg EPA estimate for the all-wheel drive model, but it is much less than what we would expect in a vehicle of this size. The Honda HR-V averages 29 mpg, the same for the Mazda CX-3. 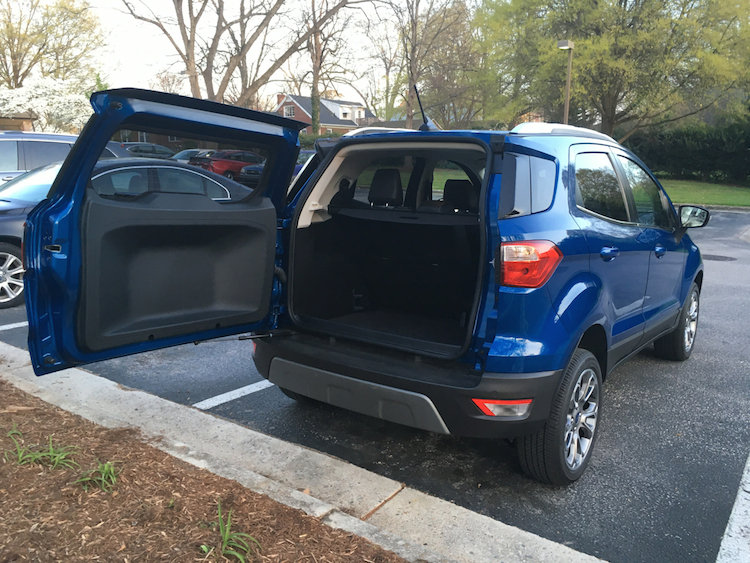 The Chevrolet Trax comes in at 27 mpg, but the EcoSport brings up the rear in this segment. The EcoSport is Ford’s first attempt at delivering a tiny SUV to the North American market. Unfortunately, the Ford is easily outclassed by more modern and efficient competitors. The current model rolled out in 2012, so it is already near the end of its lifecycle. One feature desperately needing an update is its front lighting system. The headlights are weak, delivering below average illumination. Even with the high beams on, I found the headlights weaker than competing model headlights operating in low beam. Not only was the range limited, but the general illumination was not enough to flood the road ahead. Another issue hard to ignore is wind noise. It does not simply seep in, but it whooshes inside, especially when driving at highway speeds. 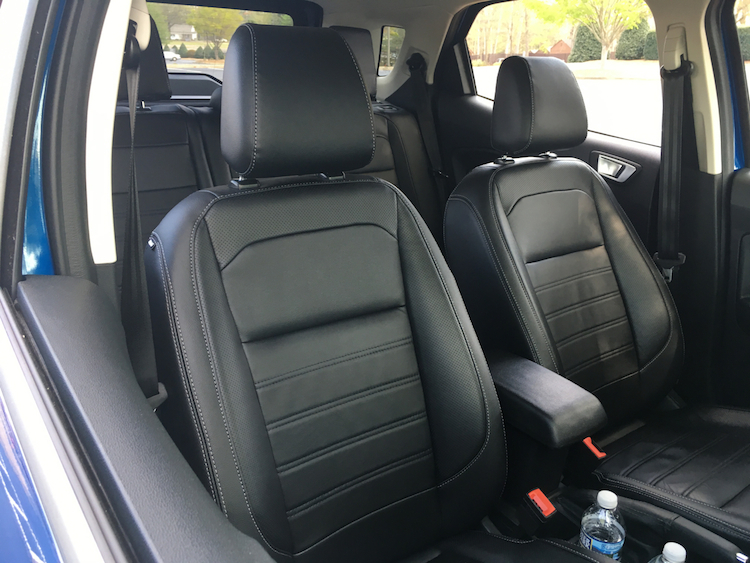 On the plus side, the front seats are comfortable, the color display is clear and the standard storage space is quite large. Should you consider the EcoSport? Only if the price comes in lower than the competition and you do not need it for more than two people. A new model should arrive within two years, therefore improvements are likely to follow. In the meantime, competing models are simply superior to this Ford in design, safety options and fuel economy.